Bensalem, PA - Rolled Metal Products, a large stainless, aluminum, copper, brass, and cold rolled strip coil distributor and processor has installed a high-production Braner/Loopco Single-Loop Turret Head™ Coil Slitting and Slit Coil Packaging System in its new facility in Bensalem, PA, a Philadelphia suburb. The new Slitting Line is capable of processing 40,000# x 60" wide ferrous and non-ferrous metal coils in gauges from .008" through .125" at slitting speeds to 1,200 FPM. 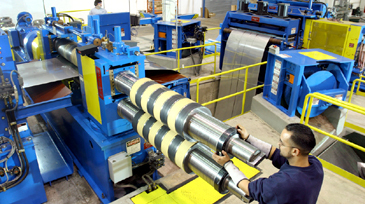 The Slitting Line is designed to process 16" and 20" ID 1,000 PIW ferrous and non-ferrous surface-critical coil to precision width tolerances with paper interleaving and PVC surface protection capabilities. 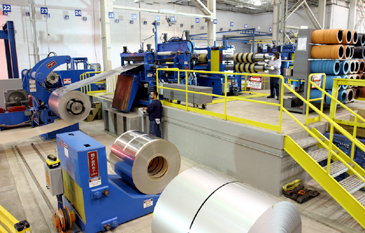 Hi-production 40,000# x 60" Turret Head™ Slitting Line processing a paper-interleaved 304 stainless coil. A "wireless" controlled Coil Car loads the Slitting Line. 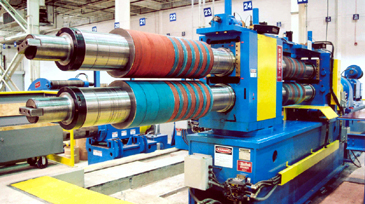 Compact Hi-Pass Line: The Rolled Metal Products Slitting Line is an example of Braner/Loopco's compact hi-pass line design that establishes the strip pass line above the coil OD so that no pass line or strip deflector rolls touch the top of the strip, an important factor for processing surface-critical coil. With an Uncoiler to Recoiler dimension of about 40', the compact system design offers operational benefits such as floor space conservation, fast coil threading, excellent coil tracking, and clear operator sight lines. Hi-Pass Line eliminates top-side strip scuffing and reverse strip bending. 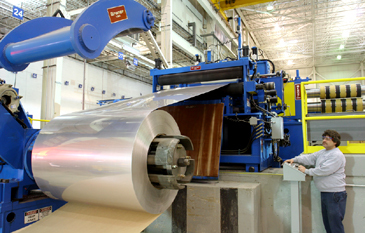 PVC Laminator: A PVC Laminator allows Rolled Metal Products to apply surface protection PVC film onto the top and bottom of surface-critical strip before the strip enters the slitter. 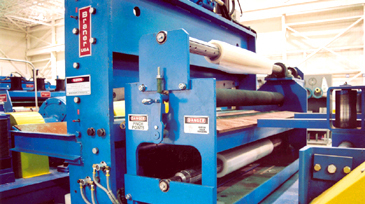 PVC rolls are supported on expanding shafts equipped with variable film tension control. Quick-opening film laminating rolls have special roll covers and variable pinch pressure. Turret Head™ Slitter: An 8" arbor x 150 HP 2-head quick-change Turret Head™ Slitter produces precise tolerance slit strips with minimal burr throughout the entire range of gauges and mechanical properties. The Slitter arbors are supported in precision machine tool quality bearings mounted in massive one-piece stress-relieved and precision ground solid steel housings that weigh nearly one-ton each. Top and bottom PVC Laminator with expandable shafts and quick-open laminating rolls. The rotatable Turret housing is supported on a 300,000# capacity anti-friction bearing for rigidity. The outboard arbor bearing housing is mounted on precision anti-friction machine tool slides and is opened and closed by pushbutton. Aluminum-bronze slides guide the vertically adjustable upper arbor bearing boxes and allow "zero" axial arbor movement. Huge upper arbor bearing boxes are positioned by motorized zero-backlash screw jacks equipped with electronic encoder digital position readouts for quick, precise positioning. Turret Head™ Slitter changes from one order to the next in about one-minute. A Turret Head™ Slitter is more rigid and precise than any other multi-head slitter design, and because the arbors are esaily accessed with no obstructions, re-tooling and order change is accomplished faster than with any other slitter head design.